People are concerned about how AI and robotics are taking jobs and destroying livelihoods... reducing our earning capacity, and subsequently destroying the economy. In anticipation, countries like Canada, India and Finland are running experiments to pilot the idea of "universal basic income" – the unconditional provision of a regular sum of money from the government to support livelihood independent of employment. But what people aren't talking about, and what's getting my attention, is a forthcoming rapid demonetization of the cost of living. Meaning -- it's getting cheaper and cheaper to meet our basic needs. Powered by developments in exponential technologies, the cost of housing, transportation, food, health care, entertainment, clothing, education and so on will fall, eventually approaching, believe it or not, zero. In this blog, I'll explore how people spend their money now and how "technological socialism" (i.e. having our lives taken care of by technology) can demonetize living. As an entrepreneur, CEO or leader, understanding this trend and implication is important... it will change the way we live, work, and play in the years ahead. Spending habits around the world tell a pretty consistent story – we tend to spend money on many of the same basic products and services. Take a look at how consumers spent their money in three large economies: The United States, China, and India. In the U.S., in 2011, 33% of the average American's income was spent on Housing, followed by 16% spent on Transportation, 12% spent on Food, 6% on Healthcare, and 5% on Entertainment. In other words, more than 75% of Americans' expenditures come from Housing, Transportation, Food, Personal Insurance, and Health. In China, per a recent Goldman Sachs Investment Research report, there is a similar breakdown -- Food, Home, Mobility, and Well-Being make up the majority of the expenditures. Interestingly, in China, consumers care significantly more about looking good and eating better (and less about having more fun) than in the U.S. – nearly half of consumer income goes to clothes and food. In India, with a population of 1.2 billion people, expenditures on Food, Transportation, and Miscellaneous Goods and Services are most prominent. Rent/Housing and Healthcare represent a smaller portion of expenditures. Now, imagine what would happen if the cost of these items plummeted. To me, "demonetization" means the ability of technology to take a product or service that was previously expensive and making it substantially cheaper, or potentially free (in the extreme boundary condition). It means removing money from the equation. Consider Photography: In the Kodak years, photography was expensive. You paid for the camera, for the film, for developing the film, and so on. Today, during the Megapixel era, the camera is free in your phone, no film, no developing. Completely demonetized. Consider Information/Research: In years past, collecting obscure data was hard, expensive in time if you did it yourself, or expensive in money if you hired researchers. Today, during the Google Era, it's free and the quality is 1000x better. Access to information, data and research is fully demonetized. In the back of my book Abundance (Page 289 of the recent edition), I provide a chart showing how we've demonetized $900,000 worth of products and services that you might have purchased between 1969 and 1989. People with a smartphone today can access tools that would have cost thousands a few decades ago. Twenty years ago, most well-off U.S. citizens owned a camera, a videocamera, a CD player, a stereo, a video game console, a cellphone, a watch, an alarm clock, a set of encyclopedias, a world atlas, a Thomas guide, and a whole bunch of other assets that easily add up to more than $900,000. Today, all of these things are free on your smartphone. Strange that we don't value these things when they become free. We just expect them. So now, let's look at the top seven areas mentioned above where people globally are spending their cash today, and how these things are likely to demonetize over the next decade or two. The automotive market (a trillion dollars) is being demonetized by startups like Uber. But this is just the beginning. Think about all of the related costs that disappear: auto insurance, auto repairs, parking, fuel, parking tickets... Your overall cost of "getting around" will be 5 to 10 times cheaper when compared to owning a car. This is the future of "car as a service." Ultimately, the poorest people on Earth will be chauffeured around. 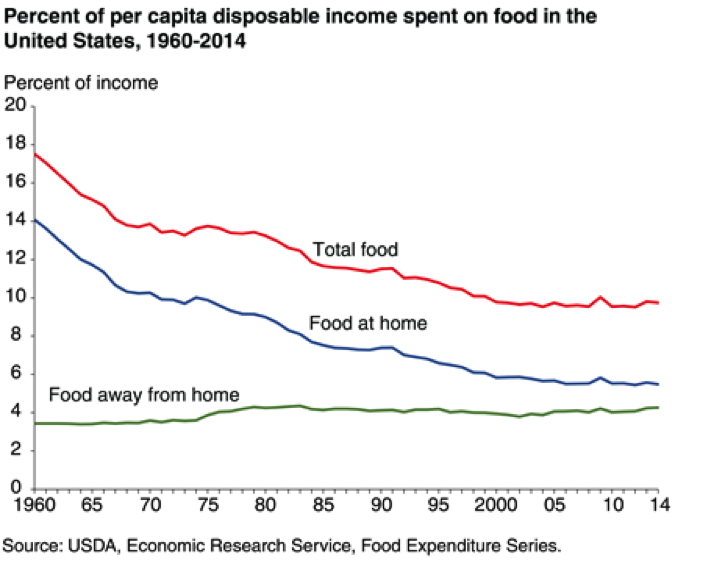 As I noted in Abundance, the cost of food has dropped thirteenfold over the past century. That reduction will continue. As noted in the chart above, the cost of food at home has dropped by >50%. Additional gains will be made as we learn to efficiently produce foods locally through vertical farming (note that 70% of food's final retail price comes from transportation, storage and handling). Also, as we make genetic and biological advances, we will learn how to increase yield per square meter. Healthcare can be roughly split into four major categories: (i) diagnostics, (ii) intervention/surgery, (iii) chronic care and (iv) medicines. (i) Diagnostics: AI has already demonstrated the ability to diagnose cancer patients better than the best doctors, image and diagnose pathology, look at genomics data and draw conclusions, and/or sort through gigabytes of phenotypic data… all for the cost of electricity. (ii) Intervention/Surgery: In the near future, the best surgeons in the world will be robots, and they'll be able to move with precision and image a surgical field in high magnification. Each robotic surgeon can call upon the data from millions of previous robotic surgeries, outperforming the most experienced human counterpart. Again, with the cost asymptotically approaching zero. (iii) Chronic/Eldercare: Taking care of the aging of chronically ill will again be done most efficiently through Robots. (iv) Medicines: Medicines will be discovered and manufactured more efficiently by AI’s, and perhaps in the near future, be compounded at home with the aid of a 3D printing machine that assembles your perfect medicines based on the needs and blood chemistries in that very moment. 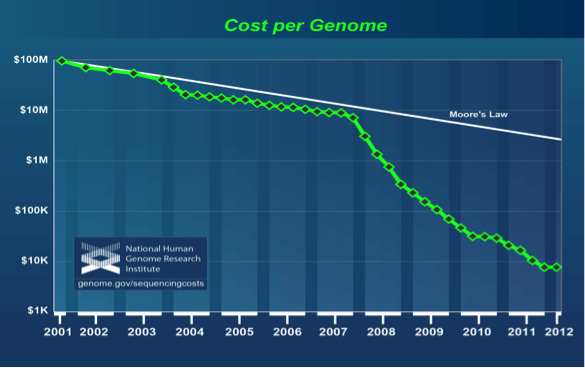 It's also worth noting the price of genomics sequencing is plummeting (as you'll see below, five times the rate of Moore's Law). Accurate sequencing should allow us to predict which diseases you're likely to develop, and which drugs are of highest use to treat you. Think about what drives high housing costs. Why does a single-family apartment in Manhattan cost $10 million, while the same square footage on the outskirts of St. Louis can be purchased for $100,000? Location. Location. Location. People flock to high-density, desired areas, near the jobs and the entertainment. This market demand drives up the price. (1) Autonomous Cars: If your commute time can become time to read, relax, sleep, watch a movie, have a meeting… Does it matter if your commute is 90 minutes? (2) Virtual Reality: What happens when your workplace is actually a virtual office where your coworkers are avatars? When you no longer need to commute at all. You wake up, plug into your virtual workspace, and telecommute from the farm or from the island of Lesvos. The second technology drivers are the impact of Robotics and 3D Printing, which will demonetize the cost of building structures. A number of startups are now exploring how 3D printed structures and buildings can dramatically reduce the cost of construction and the amount of time it takes to build a building. Five thousand times more energy hits the surface of the Earth from the Sun in an hour than all of humanity uses in a year. Solar is abundant worldwide. Better yet, the poorest countries on Earth are the sunniest. Today, the cost of Solar has dropped to ~$0.03 kWh. The cost of Solar will continue to demonetize through further material science advances (e.g. perovskite) that increase efficiencies. Education has already been demonetized in many respects, as most of the information you'd learn in school is available online, for free. Coursera, Khan Academy, and schools like Harvard, MIT and Stanford have thousands of hours of high-quality instruction online, available to anyone on the planet with an Internet connection. But this is just the beginning. Soon the best professors in the world will be an Artificial Intelligence, an AI able to know the exact abilities, needs, desires and knowledge of a student and teach them exactly what they need in the best fashion at the perfect rate. Accordingly, the child of a billionaire or the child of a pauper will have access to the same (best) education delivered by such an AI, effectively for free. Entertainment (video and gaming) historically required significant purchases of equipment and services. Today, with the advent of music streaming services, YouTube, Netflix and the iPhone App Store, we're seeing an explosion of available selections at the same time that the universe of options rapidly demonetizes. YouTube has over a billion users — almost one-third of all people on the Internet — and every day, people watch hundreds of millions of hours on YouTube and generate billions of views. The things we spend our money on are continuing to rapidly demonetize. This means that the quality of our lives is going to go up as we inch closer to a post-scarcity world of Abundance.